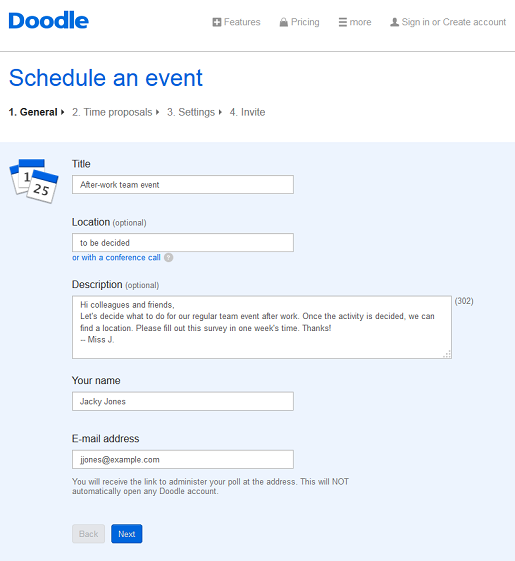 Doodle makes it remarkably easy to better organise and plan events, meetings, appointments and more. Simply visit Doodle.com to get started. You can sign up for a free account using your Facebook or Google+ account. Don’t worry, Doodle doesn’t take your information and use it for third party advertisement; signing up via your online network profiles simply makes the process faster. Alternatively, you can sign up for a free account with simply your name and email address. Though you can use the online voting tool without registration, it’s strongly advised that you create a free Doodle account so you can reap the further benefits that Doodle offers. Once you’ve registered a free account (which is not mandatory) you can begin creating an online vote tool. Click on “schedule an event” to begin Step 1. Here, you’ll enter the title, your name and email. The latter two pieces of information are required so that you can edit, manage or delete the poll later. In the example pictured below, the head of the IT department Miss Jacky Jones would like to organise her team’s regular group event. Step two for Miss J’s group event involves proposing times for the event. Fridays are usually best, but she selected a number of Fridays and Tuesdays in August, just in case some of her colleagues were planning on leaving for holiday or travelling at the weekend. Doodle’s online voting tool is very flexible, and you can add as many proposed times as you’d like on the days you’ve selected. Once you’ve entered the suggested times for the event using the free online voting tool, there’s one more step before you can send off the link for people to begin voting. This is Step 3, which is optional, as the screenshot below shows. 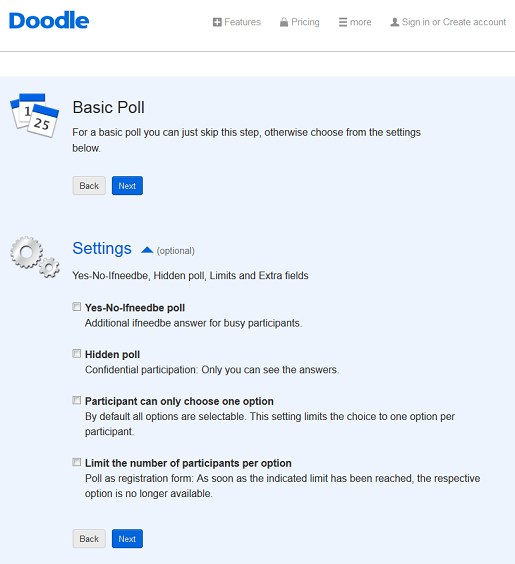 But if you so wish, you can use the extra features for more control of your poll or survey. For example, you can hide your poll from being published publicly, so that only those who are sent the direct link can find it. Or if the group event at work is in a place with limited space (such as a bowling alley or rafting tour), then you can tick the box “limit the number of participants per option”. This comes in handy, since it’s quite easy to coordinate the number of participants based on a strictly first-come-first-served basis. Once you’ve completed Step 3, you’re ready to send off your poll. You can either copy and paste the link, sending it via your own email account, or you can use the automated software provided by the free voting tool. If you have registered a free account with Doodle then you can connect your address book so that you can easily enter names into the “send” field without having to look up emails elsewhere. Doodle saves you time and money and hassle – why don’t you organise your next party or meeting with this online voting tool today?